Anyone who has ever been in a car knows that there are a large number of clueless people out there navigating the roads. With this fact in mind, it’s difficult to understand how anyone could fail the driver’s test. However, it happens every day. 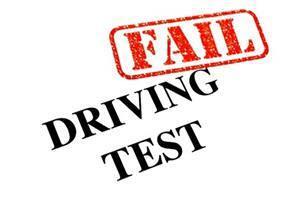 In this article, we will go over some of the most common reasons that new drivers don’t do well on the test. This mistake is simple but major. If you change lanes without using your turn signal or adequately checking your blind spots, you’re putting your life and the lives of others on the road in grave danger. You’ll also more than likely end up failing the driving test. When your DMV testing official instructs you to change lanes, always remember to signal, check your mirrors and check your blind spot before making a move. When you’re taking the driving test, your ability to control the vehicle is one of the things that the testing official will be watching carefully. Avoid driving with one hand. It may make you look more calm and collected, but it also increases your risk of allowing the wheel to slip. DMV officials want to see you drive with both hands securely on the wheel. During the driving test, you might find yourself approaching a four-way stop sign. It’s possible that no one else will be at the intersection, and all you will need to do is come to a stop before carrying on. However, if other vehicles are present, you’ll need to know right-of-way law. When you and another car reach the intersection at the exact same time, whoever is farther to the right is allowed to go first. At “T” intersections, the cars on the through street have right of way. Rolling stops are a very common (and silly!) reason for failing the test. When you stop at a stop sign or red light, you must come to a full stop. Slowing down to a near stop is not enough, and a DMV testing official will absolutely mark down your score for it. If you want to be a good driver, you will need to learn how to work the brake pedal on your car. Different vehicles have different levels of sensitivity when it comes to the brake, so it’s important to make sure that you’ve practiced driving using the vehicle you will be testing with. Hard braking is acceptable in an emergency, but if you send the DMV official lurching forward in his or her seat every time you come to a stop, you won’t likely pass the test. Riding right behind someone’s bumper is a big no-no in the world of driving tests. Always be sure to stay a few car lengths behind the guy in front of you. Not only will it help you pass the test, but it’s a good habit to get into. You can’t stop on a dime, and having that cushion of space will do a lot to ensure your safety if the car in front of you comes to a screeching halt. You would think it would be obvious to drive the speed limit while taking a driving test, but people do actually make the mistake of speeding. Sometimes, you can become so caught up in trying to drive in the correct lane, use your turn signal and control your steering, it’s easy to let that speedometer begin creeping up. Driving is a balancing act, and if you’re having trouble doing all of these things at once, you likely need more practice before taking the test. In some cases, that ultra-nervous and careful state that many find themselves in during the driving test can lead to the opposite problem: driving too slow. While it’s usually better to err on the side of going too slow versus too fast, neither is going to make the DMV official think you’re ready for your license. Do your best to relax and drive at a reasonable pace. It’s never legal to change lanes in the middle of an intersection. To properly change lanes, you must use your turn signal, and while in the middle of an intersection, your turn signal is used to show that you are turning in a different direction. Therefore, there is no proper way to alert other drivers of a lane change in an intersection, and it must be avoided. The word is getting out on texting and driving. Research has shown that it’s the equivalent of driving while blindfolded. You’re probably smart enough to know that pulling out your cell phone during the driving test is a death wish as far as getting your license, but be aware of other potential distractions as well. Fiddling with the radio and looking at the sights along the side of the road could cause you to make a serious mistake.